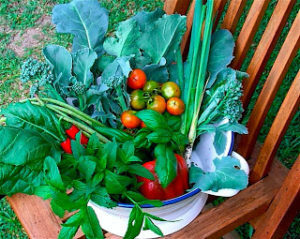 If you have followed my recipes before you will know that I always endeavour to cook things that are easy to make, delicious and with ingredients that are the freshest and cheapest around. This is all of those things but you will just need to put aside a little more time for this one but, believe me, it is well worth it – it’s something I make for special occasions as everyone just loves it. 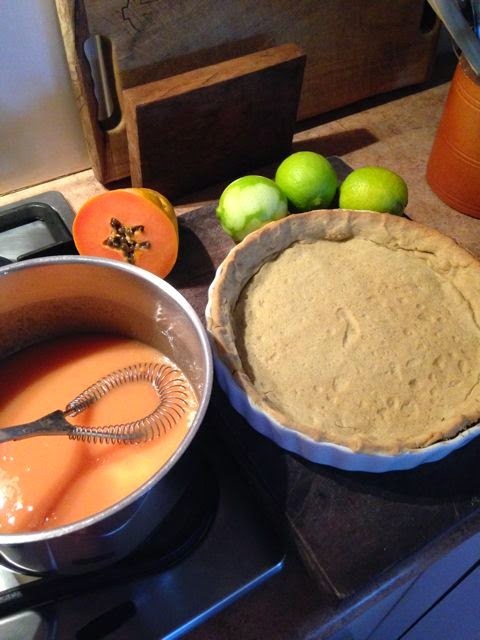 Out to impress – well this is the pie for you! I got the ispiration to make this from recipes of two of my favourite cooks Belinda Jeffery (Desserts) and Janet de Neefe (Bali-The Food of my Island Home) – in fact I think I ate something similar to this is Janet’s restaurant Indus in Ubud, Bali. 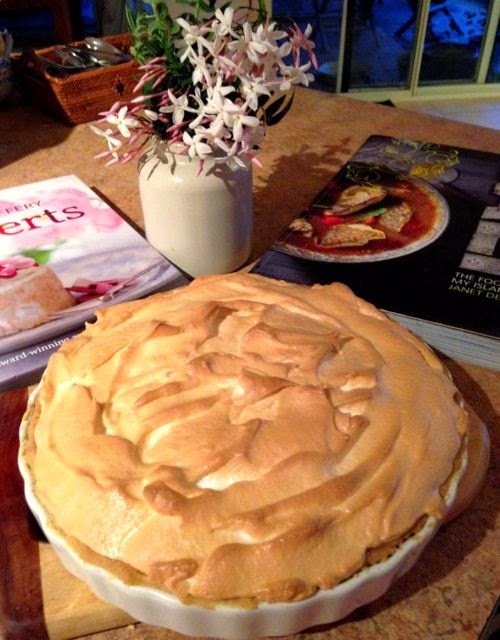 I was looking to make a dessert to go with an Asian inspired meal and this perfectly fitted the bill – it’s very similar to the traditional lemon meringue pie with just a tropical twist. It helped that I had just harvested fresh limes and papaya from my garden and had happily accepted yet another dozen fresh eggs from my neighbour who has very happy and productive chooks. NOTE: The filling is a lime-papaya curd. Cooking a ‘curd’ often calls for a lot of time consuming stirring over a double-boiler which you don’t need to do with this recipe – it all goes in together (I’m trying to make it simple!). 2. Put the flour and icing sugar in food processor and blitz to combine. 3. Add the butter and blitz until the mixture resembles fine breadcrumbs. 4. Add the egg yolk and blitz until dough combines into one ball. 5. Turn out onto lightly floured surface and knead briefly then press lightly into disc. 6. Cover in plastic wrap and refrigerate for 20 minutes. 7. Butter a 24 cm loose-bottomed pie tin or fluted quiche dish. 8. Roll the dough on a floured surface to shape of pan then lay inside. Trim off excess. 9. 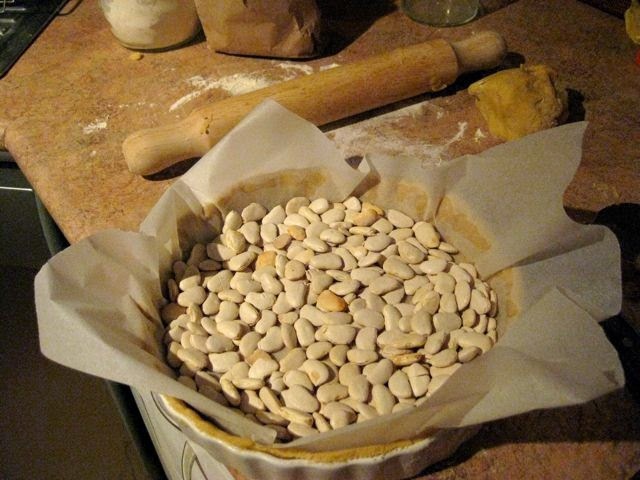 Line pastry with non-stick baking paper and fill with pastry weights; I use dried beans. 10. Bake for 15 minutes. Remove the paper and weights, return to the oven and cook for further 5 minutes. Remove from oven and cool. TOP TIP: Do not use foil for this – it will stick to the pastry. 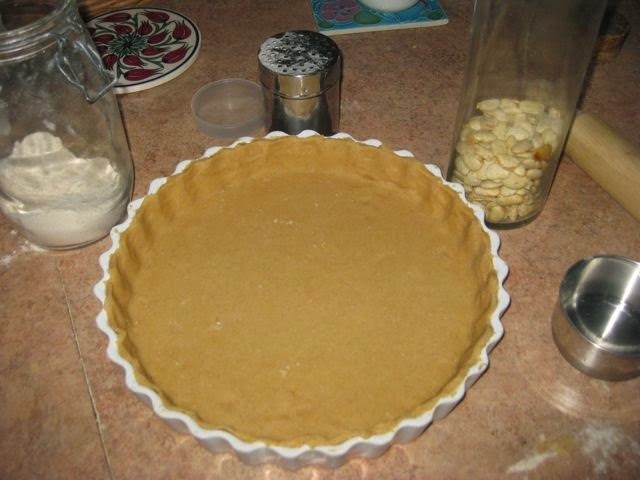 NOTE: This is called baking blind and is pre-cooked in this way to ensure that the pastry is cooked through and does not go soggy when the filling is added. TIP: I always make a double batch of pastry and freeze half of it for next time. 1. Put papaya, sugar and water in food processor and blend to fine pulp. 2. Put the cornflour in a saucepan and mix to a smooth paste with a little of this papaya juice, then add the rest of liquid and stir to combine. DON’T PUT THE HEAT ON YET. 3. Lightly beat the whole eggs and yolks and pour into saucepan, whisk in. 4. Add the lime juice and zest. 5. Melt the butter and add that too – stir to combine. 7. Pour into cooked pastry case and let it cool before adding the meringue. 2. Put the three saved egg-whites and pinch of salt into a clean, dry bowl and whisk until. they form stiff peaks. TIP: Meringue won’t work if the utensils are slightly wet or dirty. 3. Add the sugar gradually until you get your peaks back. 4. 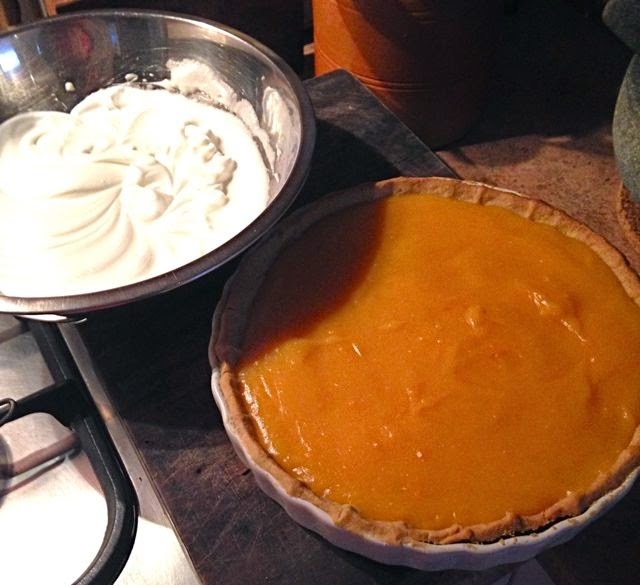 Spread the meringue over the pie right to the pastry edge. Use the back of your spoon to make fancy swirls – remember, you are here to impress! 5. Bake the pie for 10 minutes or so until the meringue is golden brown. Did I mention that it is worth the effort and absolutely delicious?